Mobile Phones for Big Kids: Yay or Nay? There’s a big question for every Mum and Dad out there: What’s the right age to give your kid a mobile phone? You probably heard people or even seen them giving their kids as young as 5 years old gadgets which are not only limited to iPad, tablets, laptops, etc. Parents for the sense of security and because they well know that it is the digital age give their kids mobile phones. The rationale behind as to why they give in to the whining, begging and lobbying of their little ones, is because first, they can’t help but be parents who want everything for their child. Secondly, well, there is a sense of security when a parent gives her child a mobile phone, especially when the child is taking public transportation home from school. Having a mobile phone is a good idea from a safety standpoint. But then again, let us go back to the question: When is the right time? Many parents wrestle with the issue of cell phones for kids. What’s the right age for kids to get cell phones, and what functions are age appropriate? And what about smart phones with their abilities to download apps (not to mention their additional data plans!)? Do they really need a smart phone that is also their music device, a portable movie and game player, and portal to the Internet? Do they need something that gives their location information to their friends — and maybe some strangers, too — as some of the new apps allow? However according to Christina Pesoli of Hufftington Post, there are 4 reasons to place on hold any plan to give your child a mobile phone. It makes your kid less safe. Parents often cite safety as a major reason for wanting to give their child a cell phone. They believe that the ability to easily reach their kid — and vice versa — means she is somehow safer. But I submit the result is exactly the opposite. Giving a child a cell phone creates a false sense of security and that can cause parents to be less diligent about the details of their child’s whereabouts. And while it’s true that a cell phone makes it easy for you to reach your kid anytime, anyplace, it also makes it easy for everyone else to reach your kid, anytime, anyplace. And this easy access and overexposure can dramatically reduce your child’s safety. The bottom line here is whether your kid is at school or pretty much anywhere else, a cell phone riding around in her backpack or gym bag is completely superfluous. It will only serve to bring the total number of phones within arm’s reach from a bazillion to a bazillion and one. Rather than giving your child a cell phone, do something that will really make a difference in terms of her safety and quality of life. Make an effort to get to know the teachers, coaches and other parents well enough to exchange contact info and even cell phone numbers with them. It pushes socialization underground.Some parents claim their child needs a cell phone to keep up socially. While no parent likes the thought of her child being excluded, the truth is there are some things your kid is better off being left out of. 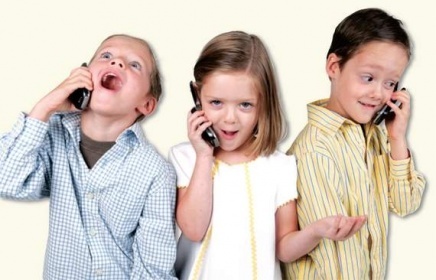 If your child doesn’t have a cell phone, she’ll have to keep up with her friends either by talking to them in person or by calling them from your cell phone (or, if you’re really old fashioned like me, from your home phone). In other words, she’ll have to do what you had to do when you were a kid. And when you stop to think about it, is that really such a bad thing? It makes it harder to live in the moment. Research indicates that being constantly wired-in to technology in effect rewires the human brain. It makes surface friendships easier than ever, but deeper friendships harder to come by and more difficult to maintain. And if that’s the effect on adults, imagine the impact on children whose brains are still developing and who have yet to fully figure out how to have and be a friend. With messages from elsewhere constantly beckoning your child, it is difficult for her to be fully present in whatever situation she is actually in. Burn jokes aside, you get my point: There are plenty of things that are useful in everyday life that we nonetheless protect our children from until they are much older. Cars are as ubiquitous as they are essential, but you don’t see parents clamoring to put little kids in the driver’s seat. What are your thoughts and practices in this issue? How do you do it in your household? SHARE it with us Mums and Dads!